​If you want to grow your own fresh, organic plants and vegetables at home but lack garden space, you still can with an indoor growing system (known as Hydroponic Systems). These high quality systems allow you to grow plants, vegetables and fruit indoors and are easy to maintain and use. Dealzer is a leading provider of hydroponic gardening systems and the benefit of using a system like this is that you can have fresh vegetables all year round. You can grow everything from plants to vegetables and because it's indoors you don't have to worry about the weather interfering with your crop. Dealzer indoor systems are great for any gardener and are compact and easy to use. Additional hydrponic systems are featured here as well. There are many benefits to growing indoors, the weather need not affect your crop, you don't have to worry about all your hard work being ruined by pesky pests or disease and you can work in a small area of your home. You can grow all year round which is a huge benefit if you want to enjoy seasonal vegetables or if you love to cook and like to have a supply of fresh herbs ready to use at any time. The PC grow box is one of the coolest offered by Dealzer; it looks just like a PC. This grow box also comes with a complete odor control system that uses carbon pads in the air flow section. It is 100% light proof and has more accessories than any other similar PC grow box on the market. It has a great deal of interior space and is capable of sustaining two plants that can grow as tall as you want. A three year warranty and a lifetime of tech support and instructions are included. If you’re looking for one of the best systems to grow plants indoors then a Dealzer Grow Box is what you need. The Dealzer PC Grow Box has more features than any similar Hydroponics System on the market. It ships fast with stealth shipping & comes with EVERYTHING needed except the plants. Powered by a Two Plant Hydroponics System and a 6 quart reservoir, it also has 2 Organic starter plugs and pre-installed germinating helpers. The PC Grow Box by Dealzer is a light proof enclosure with a wireless temperature and climate control gauge. A pH testing kit, Odor proof system that uses an ONA block for maximum odor absorption, and light reflection panels for maximum light exposure all come standard. A Wireless Temperature and Humidity Guage, Heavy Duty Timer, are also included along with a Lock and Key System when ordering this PC Grow Box. 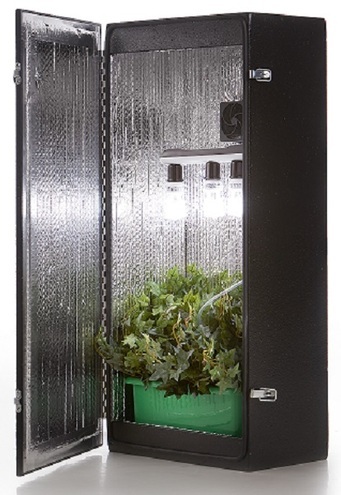 The Cash Crop 6 grow box from Dealzer is very popular because not only easy to use, but it is also very affordable. Amazon usually has good deals if you are looking to purchase one of these great grow boxes. The price beats anyone out there. Dealzer also offers a lifetime warranty with the Cash Crop 6 grow system. This smell proof and light proof personal garden is very easy to use. Cash Crop 6 comes with everything you need, including a self-cooled cabinet and hiflect insulation for maximum light usage that optimizes plant growth. Your plants should grow to fill the entire box. It is a small unit, but it is very effective. Tomatoes, herbs, and peppers will grow easily in this unit all year round. The company offers a guarantee as well.